Department of Neurology, David Geffen School of Medicine, University of California, Los Angeles, California, U.S.A.
Migraine is a syndrome characterized by periodic headaches. Often, however, patients experience other symptoms, including hearing loss, tinnitus, and dizziness; and in some cases, these can be the only symptoms. Migraine is nearly always familial and occurs in complex patterns and settings. The association of migraine and dizziness dates back to the nineteenth century when Liveing noted their connection in his book On Megrin: Sick Headaches and Some Allied Health Disorders. Overall, episodic vertigo occurs in about one-quarter of patients with migraine headaches—approximately the same frequency as that of the classical migraine visual aura. In addition, patients with migraine frequently report sensitivity to motion, with bouts of carsickness in childhood and motion sickness as adults. Auditory symptoms are generally considered less common than vestibular symptoms with migraine, but phonophobia occurs in more than two-thirds of patients, usually in association with headache. Tinnitus is also very common and sudden deafness occurs in a small percentage of patients with migraine. Recent advances in exploration of the genetics and pathophysiology of migraine provide new hope for understanding the link between dizziness, tinnitus and hearing loss, and the periodic headaches characteristic of the disorder. An abbreviated version of the classification of migraine developed by the International Headache Society (IHS) is shown in (Table 1) (1). Migraine without aura (MO) is by far the most common variety and is best described as a sick headache. Rigid criteria for the diagnosis of MO have been established by the IHS (see "Diagnosis"). Migraine with aura (MA) is defined as "an idiopathic recurring disorder manifesting with attacks of neurological symptoms unequivocally localizable to cerebral cortex or brainstem, gradually developed over 5 to 20 minutes, and usually lasting less than 60 minutes." The visual symptoms, including the classic scintillating scotoma and fortification spectra, are the most commonly recognized aura phenomena, but somatosensory and vestibular symptoms are probably equally common. Although less common, basilar migraine and migraine aura without headache are of particular interest from a neurotologic point of view. Migraine with typical aura Migraine with prolonged aura Familial hemiplegic migraine Basilar migraine Migraine aura without headache Migraine with acute-onset aura Ophthalmoplegic migraine Retinal migraine recurrent vertigo), but a diagnosis is difficult to obtain without the presence of typical headaches at some time during the course. Basilar migraine is a subtype of MA characterized by recurrent headaches, preceded by multiple neurological symptoms such as vertigo, ataxia, dysarthria, tinnitus, and visual phenomena consistent with ischemia in the distribution of the vertebrobasilar system (1). Motor and sensory symptoms such as circumoral and extremity paresthesias, weakness, and drop attacks are occasionally seen, as well. When vertigo occurs, it usually has an abrupt onset and lasts 5 to 60 minutes. Headache following the aura is usually occipital and can be unilateral or bilateral, but it can occur anywhere, especially in children. Migraine is among the most common reasons for outpatient visits to physicians, resulting in more than 18 million visits annually in the United States. It is estimated to affect approximately 15% of women and 5% of men. Approximately 20% of adults with migraine indicate that their headaches began before the age of 10. In the prepubertal period, boys and girls are approximately equally affected, but at puberty, migraine decreases in boys and increases in girls so that a 2.5:1 female preponderance is established by adulthood. Although migraine usually begins before the age of 40, a substantial number of adults are affected later in life. Basilar migraine is estimated to affect 10% to 24% of patients suffering from migraine. One must be alert to the possibility of basilar migraine in any patient presenting with transient vertigo and other posterior fossa symptoms. Some patients are unaware that migraine is the cause of their headaches and are much more concerned about the aura symptoms. Probably the most common characteristic of migraine symptoms is the classical visual aura. It typically begins with a small scintillating scotoma that gradually enlarges over 20 to 30 minutes. There is convincing evidence that the visual aura is secondary to a spreading wave of cortical depression beginning at the occipital pole and then gradually spreading across the cortex before stopping at the central sulcus (1). Although decreased cerebral perfusion is associated with the spreading wave of depression, it is probably a secondary phenomenon rather than a primary process. The spreading wave of cortical depression is associated with marked accumulation of extracellular potassium that must be cleared before neuronal activity can return to normal. Although the exact mechanism for the spreading wave of depression is not known, most agree that the initial event is local buildup of potassium in the extracellular space. The spreading wave of depression and associated increased extracellular potassium can lead to a typical migraine headache. Trigeminal nerve fibers surrounding pial arteries on the ventral surface of the brain are depolarized by the high potassium concentration. This in turn leads to a release of neurotransmitters such as substance P and calcitonin gene-related peptide by both orthodromic and antidromic conduction. The result is an increase in vascular permeability, dilatation of cerebral vessels, and a local inflammatory response, further activating pain-provoking fibers of the trigeminal vascular system. Thus, the headache of migraine could be a secondary phenomenon, the end result of a local increase in extracellular potassium concentration. Vasomotor abnormalities have long been considered in the pathophysiology of migraine symptoms. Vasodilatation of extracranial vessels accompanies the typical migraine headache. Vasospasm occurs in some intracranial vessels with migraine, although, as mentioned above, there is controversy regarding its role in the production of symptoms. Although vasospasm is associated with classical migraine visual aura, it is most likely that vasospasm results from a metabolic defect slowly spreading across the cerebral cortex and is secondary to hypometabolism. Vasospasm is, however, more likely a cause of retinal and labyrinthine migraine. Some patients experience episodes of monocular blindness, and when examined during these episodes, there is vasospasm of the retinal arteries. Furthermore, such patients respond to antispasmodic agents. Sudden episodes of hearing loss and vertigo associated with migraine may be secondary to vasospasm of the cochlear and/or vestibular branches of the internal auditory artery. These disorders also often respond to antispasmodic agents. One way to explain the heterogeneity of migraine syndromes is to postulate a group of defects in genes that code for a family of proteins with similar properties and functions. A family of ion channels is appealing in this regard, because many of the migraine syndromes share the clinical features of the known inherited ion channel disorders. With the finding of an abnormal voltage-gated calcium channel gene and a sodium-potassium ATPase gene in familial hemiplegic migraine syndromes, mutations in other channel genes are a prime candidate for other migraine syndromes, including migraine with and without aura (1,2). These channels are remarkably diverse in their conductance and gating mechanisms, and most neurons express several subtypes that are characterized by different functional and pharmacological properties. A defective channel protein could explain the local buildup of extracellular potassium that initiates a spreading wave of depression in migraine. Since protein channels in the inner ear are critical for maintaining the potassium-rich endolymph and neuronal excitability, a defective channel shared by the brain and inner ear could lead to a reversible hair-cell depolarization and auditory and vestibular symptoms. The headache of migraine could be a secondary phenomenon, the end result of a local increase in extracellular potassium concentration. Many of the well-known triggers for migraine symptoms, including stress and menstruation, could result from hormonal influences on defective channels. Numerous studies over the years have documented familial aggregation of migraine, and some have suggested that a positive family history should be part of the diagnostic criteria. In nearly all studies, the incidence of a positive family history in patients with migraine headaches was significantly greater than in controls (the incidence of a positive family history varies from approximately 40% to 90%, compared with approximately 5-20% in controls). The percentage of positive family histories tends to be greater in those studies in which family members were individually interviewed than in studies that relied on questionnaires or the recall of the proband. Studies in monozygotic and dizygotic twins have also supported a strong genetic component for migraine, particularly for MA (2). Also, the fact that the prevalence of migraine in African and Asian populations is lower than in European and North American populations favors a major genetic component. As noted above, MO can best be described as a "sick headache." Vague prodromal symptoms precede it, but aura phenomena are absent. The headache, unilateral or bilateral, builds slowly in intensity and may go on for several days. Nausea, vomiting, diarrhea, chills, and prostration can all accompany the headache. Nonspecific dizziness is a common complaint, and patients frequently report visual blurring and a sense of unsteadiness during the entire headache phase. Vertigo can occur before, during, or entirely separate from the episodes of headache (3). In MA, the aura typically precedes the onset of severe, throbbing, unilateral headaches. The aura symptoms slowly progress over several minutes, last 15 to 60 minutes, and then gradually abate. In about 25% of patients, however, onset is abrupt. The headache begins as the aura diminishes, usually reaching its peak in about an hour and gradually subsiding over the next four to eight hours. Nausea and vomiting typically accompany the onset of head pain. The migraine aura consists of transient neurologic dysfunction, often with visual disturbances, but it also commonly includes prominent vertigo or somato-sensory symptoms. A characteristic feature of migrainous paresthesia is a gradual spread over the face or extremity, sometimes migrating from face to extremity on the same side or sometimes crossing over to the face and extremity on the opposite side. When focal neurologic symptoms such as hemianopsia, hemiparalysis, or unilateral paresthesias occur in an aura, they usually occur on the side opposite that of the headache. Only about 12% of patients with migraine regularly experience aura with their headaches, but as many as two-thirds have occasional attacks with aura. Speculation on a relationship between migraine and Meniere's syndrome dates back to the initial description of the syndrome by Prosper Meniere in 1861 (4). He noted that both conditions commonly manifested episodes of vertigo, fluctuating hearing levels, and recurring vomiting. Although many subsequent authors also have speculated on the relationship between migraine and Meniere's disease, there is still no generally accepted mechanism to explain the connection. Numerous studies have documented that migraine can lead to permanent auditory and vestibular deficits. Asymmetries on caloric examination occur with a higher frequency in patients with migraine than in control populations. Vasospasm could lead to ischemic damage to the endolymphatic duct and sac, resulting in impaired fluid circulation and the eventual development of endolymphatic hydrops (Fig. 1) (5). FIGURE 1 Patient with long-standing migraine with aura developed sudden deafness in the left ear at age 50 and Meniere's syndrome on the right side at age 73. Postmortem examination of the inner ears showed the following. (A) Loss of the organ of Corti (arrow) and prominent fibrosis of the left cochlea consistent with old infarction and (B) Hydrops in the right cochlea (RM). Presumably, the right inner ear suffered only minimal damage with the original ischemic event, but the damage later led to the development of delayed endolymphatic hydrops. Abbreviation: RM, Reisoner membrane. anywhere from age seven to 55 and is typically associated with nausea, vomiting, and diaphoresis. The attacks often occur on awakening in the morning, being particularly common around menses in women. The duration varies from minutes to hours, and patients are asymptomatic between the spells. Several studies have shown that patients with benign recurrent vertigo have either migraine themselves or strong family history of migraine. Furthermore, the episodes of vertigo have several features in common with migraine, including precipitation by alcohol, lack of sleep, emotional stress, and female preponderance. In their initial recommendations on criteria for the diagnosis of Meniere's disease, the American Academy of Ophthalmology and Otolaryngology Committee on Hearing and Equilibrium defined vestibular Meniere's disease as recurrent attacks of vertigo without associated auditory symptoms. It was assumed that most of these patients would progress to manifest all of the symptoms of classical Meniere's syndrome; however, because there are so many causes of recurrent episodes of vertigo other than Meniere's disease, more recently, the American Academy of Otolaryngology Head & Neck Surgery Committee on Hearing and Equilibrium recommended discarding the term "vestibular Meniere's syndrome." Furthermore, follow-up studies of patients with vestibular Meniere's disease have found that only a small minority of these patients ever go on to develop the typical features of Meniere's syndrome. 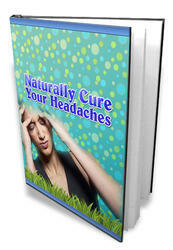 The diagnosis of migraine is relatively easy when headaches are the major feature and there is a strong family history. In patients for whom headache is less prominent, and in patients with migraine equivalents, the diagnosis can be missed if one is not aware of the diversity of this syndrome (6). Often, patients will present with aura symptoms such as vertigo and will only mention associated headache after being questioned. The criteria for the diagnosis of MO established by the IHS are summarized in Table 2. The patient must have at least five headache attacks that meet the criteria, and other causes of headache must be ruled out. No laboratory or radiological findings are specific for migraine. The physical and neurological examinations are normal and serve primarily to exclude other causes of headache. A classic migraine attack typically has five phases: a prodrome (e.g., depression, cognitive dysfunction, and food cravings), aura (e.g., visual, sensory, or motor phenomena), headache (usually unilateral and throbbing), resolution (when pain wanes), and recovery. None of these phases is obligatory for the migraine diagnosis, however. Symptoms (severity, duration, nature of prodrome or aura) also vary considerably between individuals. Thus, the diagnosis of migraine is based on a combination of sequentially occurring symptoms and paroxysmal attacks. Motion sickness is often the first symptom of migraine in children and has been recommended for inclusion as a minor criterion for the diagnosis. The IHS criteria for the diagnosis of basilar migraine require an aura that contains two or more of the symptoms listed in Table 3. Patients with isolated episodes of vertigo do not meet the criteria for basilar migraine. Some have suggested that migraine-associated vertigo must be accompanied by other migraine symptoms such as headache, photophobia, and phonophobia (6), but this would exclude the common occurrence of isolated episodes of vertigo. Until the underlying genetic mutations are identified for the common migraine syndromes, it will be difficult to establish reliable clinical criteria for the wide range of symptoms associated with the syndrome. The treatment of migraine can be divided into three general categories: symptomatic, abortive, and prophylactic. Before embarking on drug treatment of migraine, it is important to recognize that there are many common triggers for migraine symptoms (Table 4). It is often helpful to have the patient keep a log of the migraine attacks, noting any possible triggers that might be regularly associated with the attacks. As a general rule, patients with migraine must live a regimented life, with regular sleep and eating patterns. Symptomatic treatment of migraine includes analgesics, antiemetics, antivertiginous drugs, and sedatives. Antivertiginous and antiemetic medications are useful in patients in whom vertigo and nausea are prominent. Promethazine, 25 or 50 mg, orally or by suppository, is particularly effective for relief of both vertigo and nausea. Drugs in this class have a sedative effect that is usually acceptable in a patient who is eager to sleep. The decrease in gastric motility that occurs during migraine attacks can decrease the absorption of oral drugs, in addition to contributing to nausea and vomiting. Metoclopramide promotes normal gastric motility and may improve absorption of oral drugs. For many patients, aspirin or nonsteroidal anti-inflammatory drugs are adequate to relieve the headache. Food: red wines, fermented cheeses, chocolate, and coffee Eating disorders: fasting and binges patients will have a recurrence within 24 hours, requiring remedicating. Although there have been anecdotal reports of tryptans aborting migraine-associated vertigo, there have been no placebo-controlled trials documenting efficacy. Prophylactic treatment is necessary when migraine attacks are frequent and/or the severity cannot be ameliorated by symptomatic or abortive medicines. It is probably the most effective treatment for migraine equivalents, particularly episodic vertigo. Five major categories of drugs have been used: tricyclic amines, selective serotonin reuptake inhibitors, antiepileptic drugs, p blockers, and calcium channel blockers. In addition, many other drugs have been found effective according to small, controlled studies or uncontrolled observations. As a rule, the mechanism of action of these drugs in migraine is speculative. Most have been found to work on an empiric basis. In women whose migraine symptoms are periodic and premenstrual, nonsteroidal anti-inflammatory agents such as naproxen and ibuprofen or the carbonic anhydrase inhibitor, acetazolamide, can be taken for a few days each month when the migraine is expected, to prevent its appearance. In our experience, acetazolamide has been particularly effective in preventing episodes of vertigo in patients with migraine. A trial of migraine prophylaxis is warranted in any patient with episodic vertigo of unknown cause, who has a past history of migraine or a strong family history of migraine. Rarely, patients with migraine can develop permanent damage to the brain, eye, or ear. It is unclear whether this damage results from the underlying genetic metabolic disorder or the associated vasospasm. Numerous studies have found that migraine is associated with an increased risk of stroke, particularly in young people. The IHS criteria for migrainous infarction include that (i) the incident occurs during a typical attack of MA; (ii) neurologic deficits are not completely reversible within seven days; and (iii) other causes of stroke have been excluded. With basilar migraine, infarction commonly occurs in the cerebellum, particularly in watershed areas between arterial supplies consistent with hypoperfusion due to vertebrobasilar vasospasm. In some cases, labyrinthine and brain infarction occur simultaneously, since the blood supply to the inner ears arises from the vertebrobasilar system (Fig. 2) (7). Whether sudden deafness unrelated to headache can be a migraine phenomenon is more difficult to prove, but we and others have noted a high incidence of migraine in patients presenting with sudden sensorineural hearing loss. Many of these patients will have other symptoms of vasospasm, including monocular visual loss, episodes of hemiparesis or hemianesthesia, and episodes of chest pain. A small percentage of patients with recurrent monocular visual loss will go on to infarct the retina, so prophylaxis with an antispasmodic agent such as Verapamil is recommended. Compared with controls, migraine patients have an increased incidence of unilateral caloric paresis and benign positional vertigo, presumably secondary to the recurrent vasospasm of the labyrinthine artery. 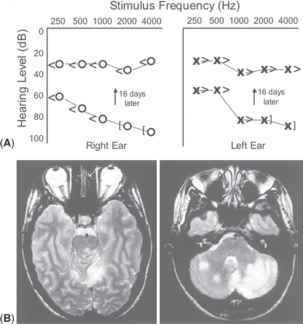 FIGURE 2 A 40-year-old man with known basilar migraine developed bilateral hearing loss associated with severe, throbbing occipital headaches, tinnitus, vertigo, ataxia, and right hemiparesis. (A) Audio-metric testing showed a severe bilateral sensorineural hearing loss that largely recovered after 16 days. (B) MRI of the brain documented infarcts on the pons and cerebellum. Abbreviation: MRI, magnetic resonance imaging. of inheritance is not always clear. Neurotologic symptoms are common with migraine, yet relatively little is known about the pathophysiology of such symptoms. Motion sensitivity with bouts of motion sickness occurs in approximately two-thirds of patients with migraine. Episodes of vertigo occur in about one-fourth of patients, and in some, vertigo is the only symptom (so-called migraine equivalent). Phonophobia is the most common auditory symptom, but fluctuating hearing loss and acute permanent hearing loss occur in a small percentage of patients. Migraine can mimic Meniere's disease, and so-called vestibular Meniere's disease is usually associated with migraine. Until the specific genetic causes are identified, however, diagnosis and treatment of these disorders will continue to be empiric. 1. Baloh RW. Neurotology of migraine. Headache 1997; 37(10):615-621. 2. Haan J, Kors EE, Vanmolkot KR, et al. Migraine genetics: an update. Curr Pain Headache Rep 2005; 9(3):213-220. 3. von Brevem M, Zeise D, Neuhauser H, et al. Acute migrainous vertigo: clinical and oculographic findings. Brain 2005; 128(Pt 2):365-374. 4. Baloh RW, Andrews JC. Migraine and Meniere's disease. In: Harris JP, ed. Meniere's Disease. The Hague, The Netherlands: Kugler Publications, 1999:281-289. 5. Lee H, Lopez I, Ishiyama A, et al. Can migraine damage the inner ear? Arch Neurol 2000; 57(11): 1631-1634. 6. Neuhauser H, Lempert T. Vertigo and dizziness related to migraine: a diagnostic challenge. Cephalalgia 2004; 24(2):83-91. 7. Lee H, Whitman GT, Lim JG, et al. Hearing symptoms in migrainous infarction. Arch Neurol 2003; 60(1):113-116. Is liss of hearin a migraine aura?